Leading Manufacturer of coding ink roller and cartridges from Vadodara. PIC’s ink rollers and cartridges are manufactured from special imported bonded cellulose fibres, which have solid highly durable porous structure. 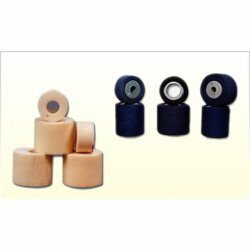 The rollers and cartridges are suitable for various Indian/Coding Ink Roller and Cartridges/FFS machines and other marking systems attached to different packing machines available in the market. The rollers are covered with cotton sleeves to prevent sticking of fibers to the rubber/polymer marking stereos. These Rollers / Cartridges are also made in various sizes as per clients coding and printing requirement and is from special bonded pure polypropylene fibres which form true gradient density from outer to inner surface of ink cartridge. These are most suitable for absorption of coding ink and the ink retains in the cartridge for longer time. The rollers are also know as wet ink roller and are excellent for marking and batch printing application on various surfaces. Looking for Coding Ink Roller and Cartridges ?